Each post mount kit has all the components you will require for ONE CORNER of your shade sail, corner anchor kits are sold individually so you can mix and match different kits to suit your installation. Suitable for through mounting on metal posts, and through beams up to a maximum thickness of 85mm. Designed for quick and easy installation with the use of a few household tools. Triangle shade sails will require three fixing kits. Square shade sails will need four fixing kits. All components are manufactured from high quality stainless steel. 2 x Carabiner Snap Hooks - 316 grade stainless steel. 1 x Hook/Eye Turnbuckle - 316 grade stainless steel. When planning your installation always ensure you have allowed enough space for your anchor and tension fittings. Always start with your turnbuckle open so it is one third engaged, this will allow you to correctly tension to your shade sail. Open kit length of 410mm (approx) with the turnbuckle 1/3 engaged. Fully engaged kit length of 350mm (approx). Installation requirements can vary depending on factors such as, soil types, anchor points, post construction and even the wind conditions in your region. If you are unsure about your specific installation please consult a qualified builder or engineer. For triangle shade sails it is recommended that at least 2 of your anchor points have tensioning devices (turnbuckles). 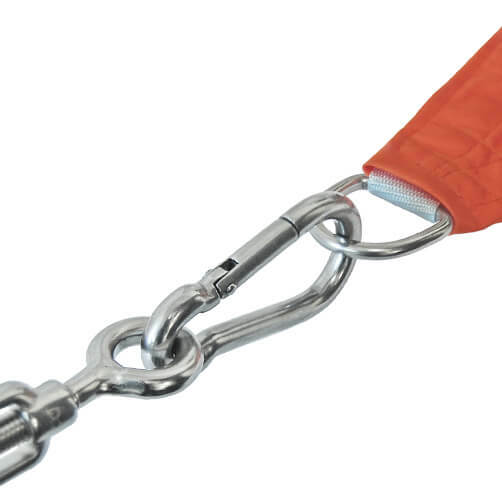 For square shade sails it is recommended that at least 3 of your anchor points have tensioning devices (turnbuckles). Metal posts should be securely set into the ground and are strong enough to take the full weight of the shade sail in windy conditions. Metal posts should be a minimum of 48mm diameter. Rope can be used to extend your shade sail to a fixing point, we recommend 6mm Polyester (Braid on Braid) Rope for this. For a quick and easy installation you will require: Drill, Wrench/Spanner and a Ratchet Strap for applying tension. Always start by marking out your intended installation, always take into account the size of shade sail and length of fixing used to allow for correct tensioning of your sail. 1. Mark mounting position for your eye bolt and drill your post. 2. Insert eye bolt so the collar sits flush with mounting surface, screw the nut in place using a wrench or spanner. 3. Start by opening your turnbuckle so that it is one third engaged. Attach one snap hook to the eye bolt and then attach the turnbuckle to the snap hook, attach the second snap hook to your shade sail. Attach the ratchet strap to both snap hooks (leaving the turnbuckle hanging). Tighten the ratchet strap until the shade sail is sufficiently tensioned. 4. You can now hook your turnbuckle onto the shade sail snap hook. Tighten the turnbuckle by turning the central body, this will bring the two end fixing closer together. 5. 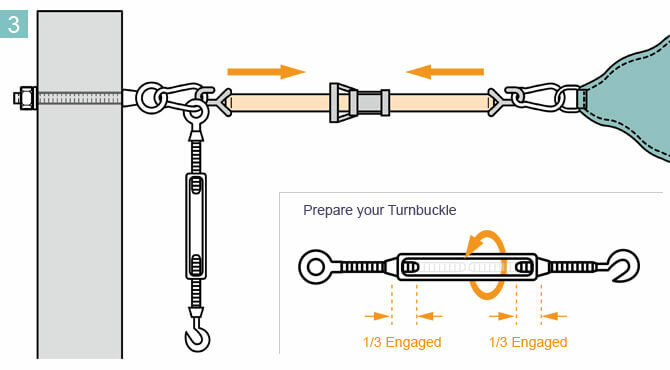 Once turnbuckle is fully tightened you can release the ratchet strap and unhook it from your assembly. Always double check that your shade sail is correctly tensioned. 6mm Braid on Braid Polyester Rope - choice of colours. 8mm Turnbuckle - Eye to Eye - 316 stainless steel. 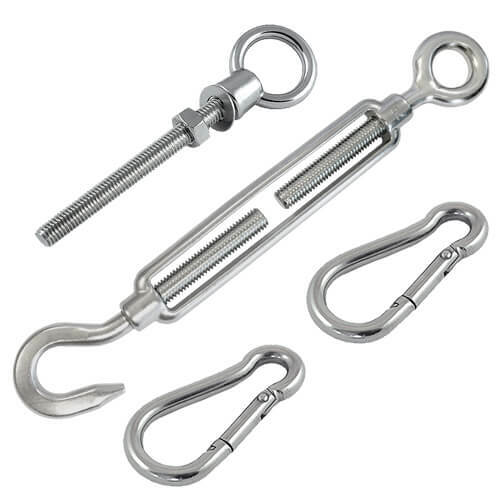 8mm Turnbuckle - Hook to Hook - 316 stainless steel.